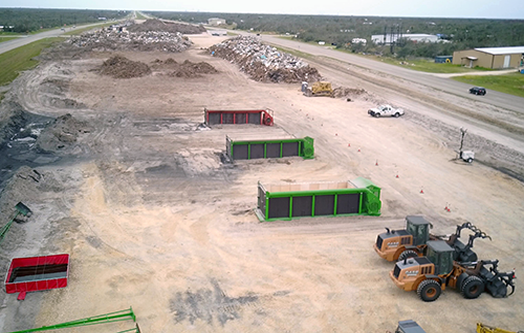 Air Burners FireBoxes by virtue of their basic design and operating features routinely produce only a modest to fair amount of Biochar, as the goal is to eliminate as much wood waste as possible in the shortest of time meeting all applicable air quality regulations. Under the CRADA, the goal is to explore design augmentations and operational adjustments to Air Burners machines, starting with its BurnBoss® (left photo), to optimize the production of Biochar in the forest where Biochar production is the primary objective. 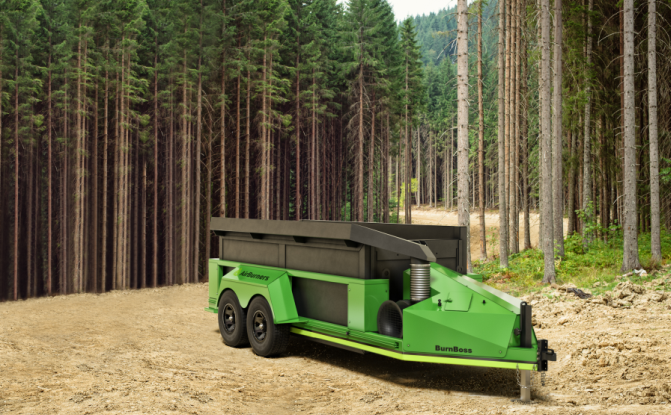 It would be desirable to eliminate wood debris from forest harvest operations, fuels management and dead tree disposal in the forest and apply the Biochar to the forest floor right there on location or collect biochar for use elsewhere, if needed. Air Burners is proud to have entered into this cooperative research and development agreement with the USDA Forest Service, the second CRADA after the company had worked with the US-EPA on its first such agreement a few years ago. 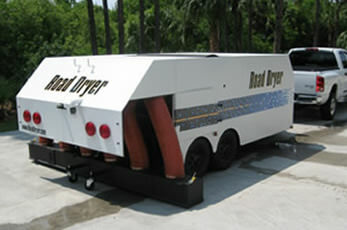 Air Burners has manufactured a trailer-mounted road and runway dryer for a number of years for Road Dryer, LLC. in Greenville, SC. 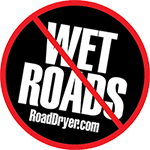 (www.roaddryer.com). The company markets the Road Dryer machines worldwide. 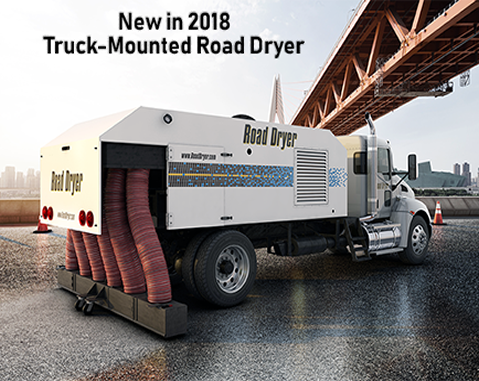 It introduced the new design, a truck-mounted road dryer, at the 2018 "World of Asphalt Show and Conference" that took place in early March in Houston, TX. The Show was a great success for the company. Road Dryer, LLC. is benefiting from Air Burners many years' experience in designing and manufacturing machinery that requires a high degree of engineering in the fields of fluid mechanics and fluid dynamics of gases. Air Burners' experience in the design and production of "Mobile Machinery", such as its line of trailer-mounted Trench Burners (T-300) and BurnBoss refractory walled FireBoxes (T-24) was another important consideration for Road Dryer, LLC to team up with Air Burners. A "Mobile Machinery" trailer is a trailer built for a particular function, such as drying the surface of a road to ready it for paving or disposing of wood waste on site; it does not carry any cargo. State of Texas: Comptroller of Public Accounts, Glenn Hegar, awarded GRADE A to Air Burners for its support of the State's 2017 Hurricane Disaster Recovery Efforts. Air Burners supplied a series of its largest FireBoxes, Model S-327 to the Texas Department of Emergency Management. The contract was administered by Air Burners' Sales Manager, Michael Schmitt. GENERAL PERFORMANCE CODE(S): (301) Shipment made early upon agency/co-op member request,(305) Exceptional customer service response,(310) Order or service completed satisfactorily,(399) Vendor commended. 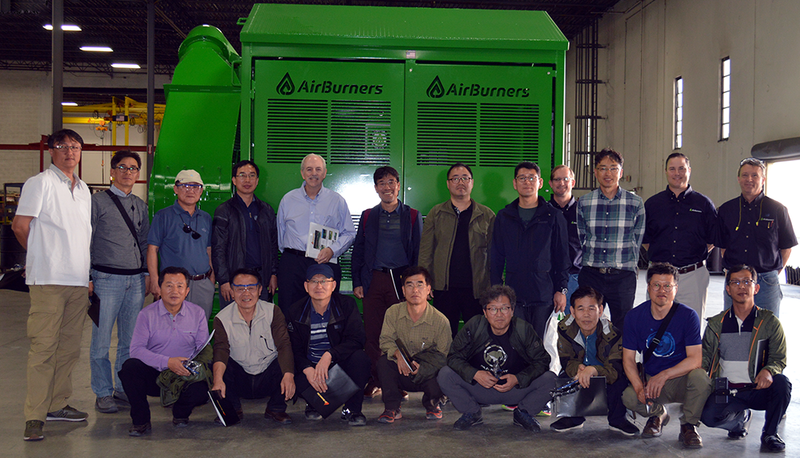 Palm City, Florida, January 29, 2018 — Air Burners was pleased to welcome at its Palm City, Florida factory sixteen visitors from South Korea including eight professors from various universities in South Korea such as Chungnam National University, Seoul National University and DAEGU University. Accompanying the professors were eight South Korean Industrialist, all forest industry experts. Forests in South Korea are suffering from tree mortality due in part to beetle infestation and other climate change associated impacts which are rapidly destroying massive numbers of trees with no end at sight. 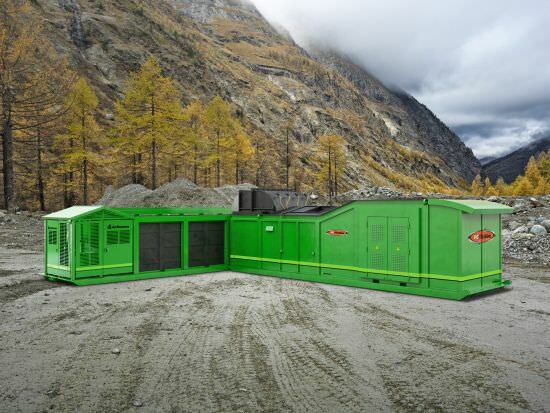 Air Burners machines have long been recommended and employed by the US Forest Service as an important tool for forest management, especially for forest fire prevention and the elimination of beetle infested trees. Forest in North America have been suffering from devastating beetle attacks for more than two decades, and Air Burners FireBox machines are the best method to help avoid the spreading of the pest to healthy trees by destroying infested stands on location in a safe and environmentally friendly manner. The Korean forestry experts are evaluating Air Burners machines for use in Korea to support the beetle eradication program there which, in the past, has mostly relied on chemical treatment, but has not successfully stemmed the spread of the beetle infestation. The visitors also familiarized themselves keenly with Air Burners revolutionary electric power generating FireBox studying the second-generation system currently in the final stage of completion in the Palm City production line. 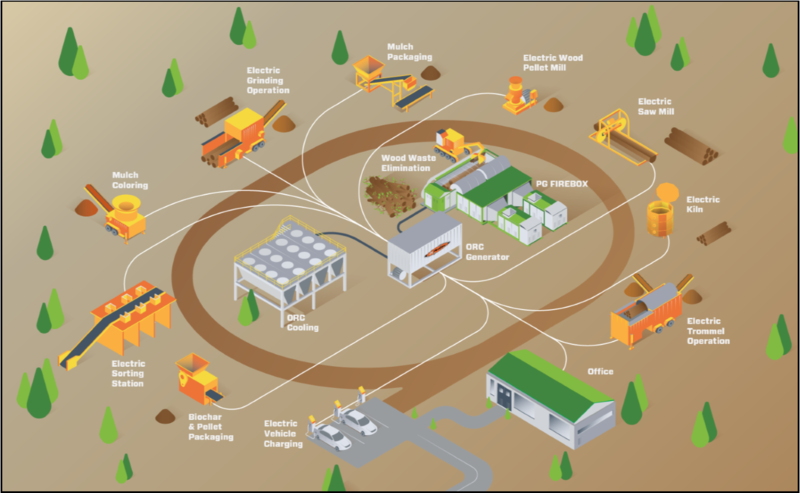 Called the PGFireBox® heat from the waste wood combustion process is converted into electricity up to 1 Megawatt that will be used to power the Air Burners machine itself and charge electric vehicles and other forestry equipment where excess power could be sold to the power company. Air Burners manufactures all its systems in the USA, and they are used worldwide, including by the US Military, Department of Homeland Security, EPA, Department of the Interior, USDA, State of California and many others government entities in the US and abroad. Air Burners selected Battle Medialab of Boca Raton, Florida to support its marketing and PR programs and to design a new corporate website. The website incorporates modern design features and is certified "mobile friendly". Air Burners well-known traditional "flame logo" has been upgraded to a more contemporary design. Air Burners' "image make-over" has been well received and Air Burners is proud of its new look.